Category Archives for "Launch Ramps"
There are five Long Beach Launch Ramps. The Davies Launch Ramp and South Shore Launch Ramp are perfect for multi day trips to Catalina, while the Claremont and Granada Launch Ramps are great for day sailing and jet skiers. If wake boarding is more your thing, you’ll want to check out Marine Stadium, which is specifically for wake boarders and rowers. All the launch ramps are $12 for launching and parking, and have a machine with a gate arm at the entrance to pay (the Granada and Claremont Launch Ramps do not have the arm). The machines accept $1s, $5s, $10s, $20s, and Visa and Mastercards. All ramps are open year round, with occasional closures for special events or filming. Security on land is handled by the Long Beach Marine Patrol and the Long Beach Police Department, who do regular patrols; on the water security is handled by the Long Beach Lifeguards, and occasionally the Police Department and Coast Guard. The Police Department and Marine Patrol can be reached at (562) 435-6711, or by calling 911 or 9-911 from the emergency phones located at the Davies and South Shore Launch Ramps. The Long Beach Lifeguards can be reached at (562) 570-1360 or (562) 436-8211. More information for all the Long Beach launch ramps can be found by calling the Rainbow Harbor Marina at (562) 570-8636. The most popular of the Long Beach launch ramps is the Davies Launch Ramp at 6201 E. Second St. 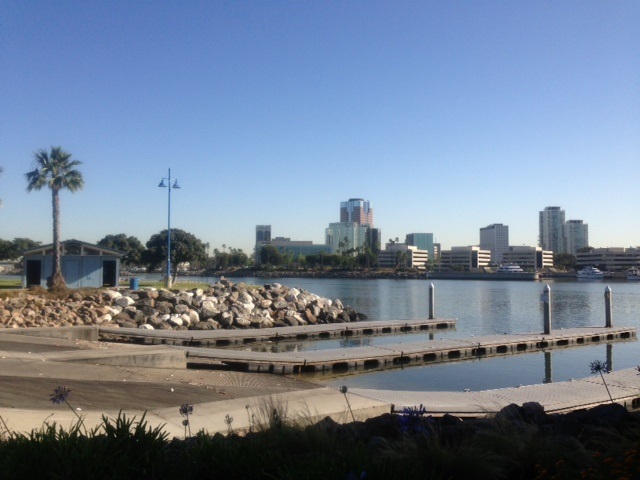 It is located deep within the Alamitos Bay Marina in East Long Beach near the Marina Pacifica condos and Gelson’s. It is also near the Naples Islands canals, and a small vessel without a cabin, such as a Boston Whaler, Glastron, or Water rod, should have no problem navigating the canals and going under the bridges. The launch ramp is open 24 hours a day, 365 days per year. Parking is limited to cars with trailers, however, so if you are bringing friends who don’t have a boat make sure you carpool; if that is not possible, parking for a car without a trailer is available down the street at the Alamitos Bay Marina in the back rows of the parking lot until 10 pm. There is a temporary dock for loading and unloading vessels, as well as 3 pump outs. A wash down is available onsite, and is free (for now), but you must bring your own hose. Public restrooms are also available at the ramp. 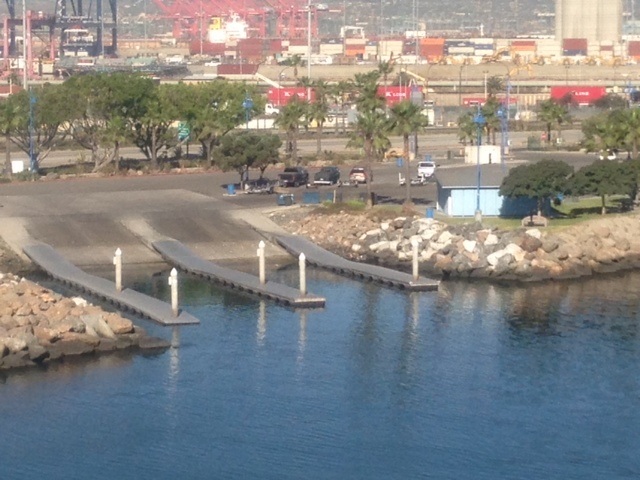 Since this is the most popular launch ramp in Long Beach it can fill up, especially in the summer or during holidays; if this happens, the city employees may direct you to launch your vessel, tie it up on the dock, and park offsite. Just down the street from Davies Launch Ramp at 5255 Paoli Way is the Marine Stadium Launch Ramp. It was originally opened in 1922 for the Los Angeles Olympic’s rowing events and is now shared by boaters and rowers alike. It is strictly limited to vessels less than 23′ in length and wakeboarders during the day. The hours are generally 8am-Sunset, except during Winter and Spring when it closes early to be used by local rowing clubs. During the Summer months, the speed limit is reduced to 5 mph after 5pm in order to let boaters anchor their boats so they can enjoy the concerts put on by the Long Beach Municipal Band, who plays on the grassy area at the north end of Marine Stadium. There are many other events held here, including the yearly Dragonboat festival and Southern California Speedboat Club Sprint Nationals. Marine Stadium can also be rented out for private special events. Just like Davies Launch Ramp, parking is limited to vehicles with trailers. Unfortunately, there is no wash down rack or any pumpouts at this ramp.There are two sets of public restrooms available at the ramp; one insude the ramp itself, and one outside the ramp, before the pay machine. For more information on upcoming events or closures, you can call the automated information line at (562) 570-3203. The South Shore Launch Ramp is located at 590 Queensway Drive, near the Queen Mary and the south end of the 710 freeway on the west side of Long Beach. Like Davies Launch Ramp, it is open 24 hours a day and has free wash down facilities. Unlike Davies, though, it has a section of the lot for vehicles without trailers. These single vehicle stalls are located at the very northwest end of the lot, away from the ramp and the hotel. There is a small park here that has tables and benches, perfect for a small picnic. The South Shore Launch Ramp is popular with boaters going to Catalina, as it is the closest launch ramp to the island and vessels are launched directly into open water. It is also directly across the L.A River from Rainbow Harbor, which has the Aquarium of the Pacific, Shoreline Village, and parts of the Pike, making it a popular destination for day trips. Handicapped parking spots are also available at this ramp, with the stalls located just to the left of the restrooms. 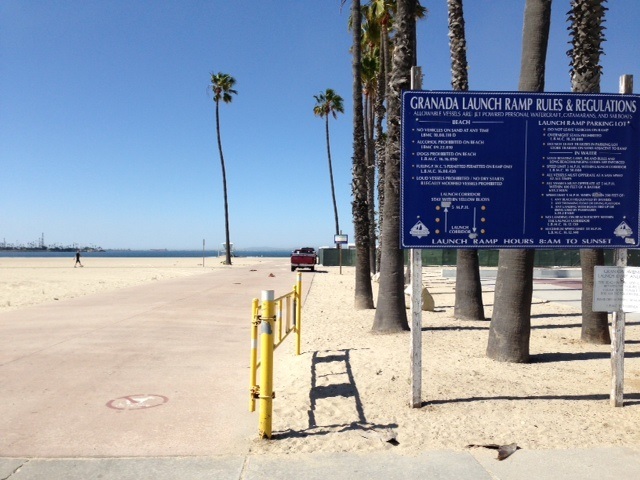 Lastly, Long Beach has two sand launch ramps, the Granada Launch Ramp and Claremont Launch Ramp. The Granada Launch Ramp is located at 1 South Granada Avenue, across the parking lot from the Belmont Pool., and is open 8am-Sunset. There is a short cement pathway that leads to the sand, where you would need to transfer your vessel to a dolly (vehicles are not allowed on the beach itself). Because it is a sand launch, it is restricted to PWCs (jet skis, wave runners etc), catamarans, and small sailboats. The Granada Launch Ramp is also home to Rosie’s Dog Beach, a popular area where residents bring their dogs for a fun day in the sun and waves. Granada beach many special events during the summer. This launch ramp is unique in that there is no gate arm to control access to the area. Instead, because it shares a lot with the Belmont Pool, it works a bit on the honor system. Vehicles launching vessels are to pay the $12 at the machine at the entrance, or, single vehicles going to the pool or Rosie’s Dog Beach can pay at the metered spots. 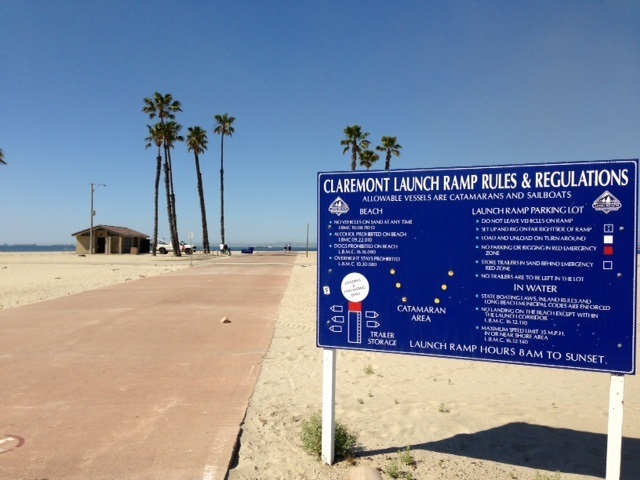 The Claremont Launch Ramp is at 5300 E. Ocean Blvd, just down the street from the Granada Launch Ramp. It is also a sand launch, and is open 8am-Sunset. Claremont only allows catamarans and small sailboats (no PWCs), and there is no metered parking. Like Granada, there is also no gate arm at the pay machine. It also features kite surfing, kite boarding and paddle board rentals through Southern California Kite Surfing. Southern California Kite Surfing is currently the only vendor permitted for kite surfing in Long Beach, although the city council has approved two other companies to do business. 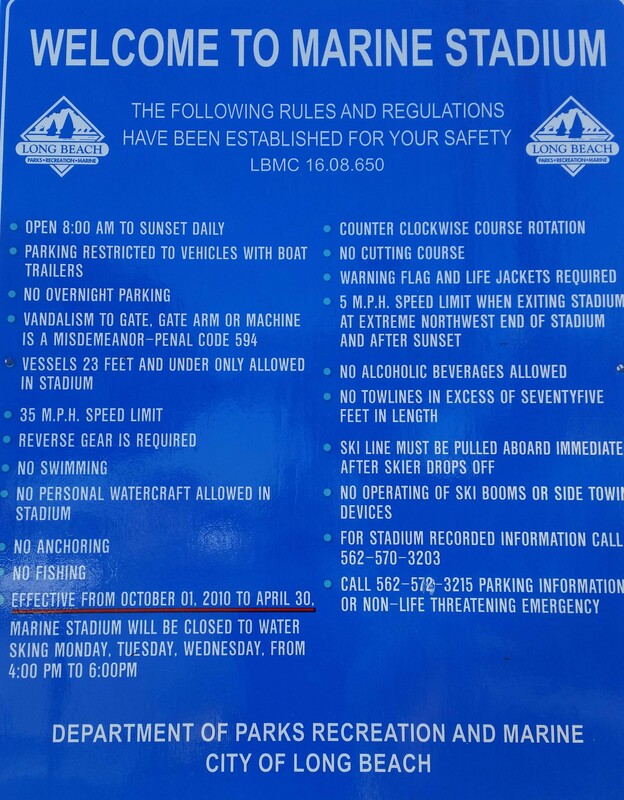 There are only five dedicated parking spots for boat launching and fills up in the summer, so you’ll need to arrive early, or make back up plans to use Granada if it is full. Another unique feature of the Granada launch ramp is that it is the only launch ramp covered under the yearly parking passes that are available for purchase. 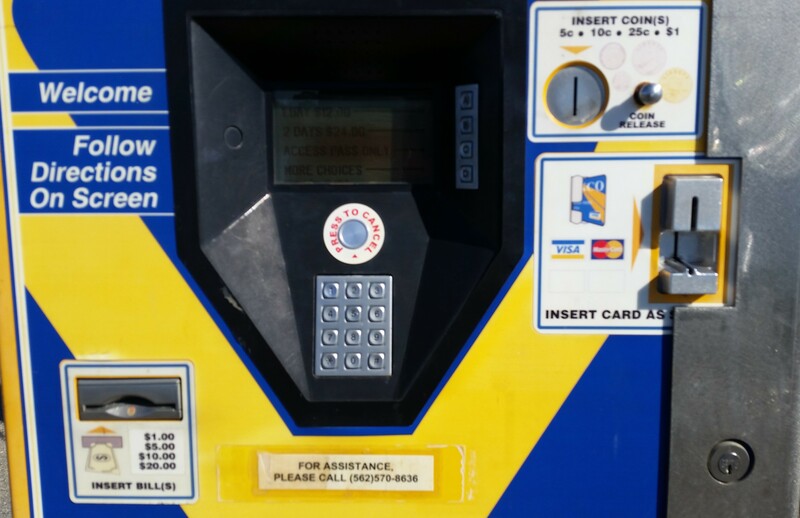 The Annual Beach Parking Pass program allows visitors to park there from 8am to 6pm, even without launching, feeding the meters, or paying at the machine at the entrance. See our post on parking for more information, or go to http://www.longbeachparking.spplus.com/. Fees at all the Long Beach launch ramps are paid at the machine located at the entrance. The Davies Launch Ramp, South Shore Launch Ramp, and Marine Stadium Launch Ramp all have a gate arm at the machine, but the Claremont and Granada Launch Ramps do not. All the machines take cash ($1-$20 bills), Visa, and Mastercard. 2. Insert the cash into the slot to the lower left of the key pad, or slide your card into the reader to the right of the screen (make sure the front of the card is facing to the left). 3. If you are successful, the machine will drop your receipt into the slot below and the gate arm will go up. Make sure to put the receipt on your dashboard; the Long Beach Marine Patrol is not shy about handing out citations. Please be aware that since the machines are automatic and there is no attendant on site, there are no “ins and outs” at the South Shore, Marine Stadium, and Davies Launch Ramps; once you leave, you will have to pay to get back in. This includes if you need to leave to buy a battery or have any other mechanical problems with your vessel. The Marine Stadium, Claremont, and Granada Launch Ramps all close at dusk, so to use those machines simply omit the first step and feed your cash or slide your card into the machine and collect your receipt. Again, make sure to put the receipt on your dashboard. There is also an option for “Access Pass” on the screen. Currently, this is simply the system for Marine Bureau employees to access the ramp with their employee cards; however, in the future a prepaid card system will be put into place that will be accessed through this option. Do you have polarized sunglasses on? Polarized sunglasses can make the screen hard to see. Is there a glare from the sun? This is a problem mostly at the South Shore Launch Ramp, but sometimes the glare from the sun can make the screen look washed out. Are you paying with any bill larger than a $20 bill? The machines are programmed to only accept $1s, $5s, $10s, and $20s. Anything larger will be rejected. Are your bills crumpled? The machines can be picky about the bills they accept, you may have to try another. Is the red light flashing on the bill accepter? This means there is a bill jam, and you will have to call the Rainbow Harbor Marina office at (562) 570-8636 or use a credit card. Are you using a Visa or Mastercard? Amex and Discover cards are not accepted at any city facility. Are you sliding it properly? Too fast, too slow, or not deep enough and the machine will not read your card properly. Is the front of the card facing to the right? Make sure the magnetic stripe is in the upper right hand corner of the reader. Most likely there is a problem with your bank’s processing center. You’ll need to press the “cancel” button (the large, silver button under the screen) and use cash. You did not receive your change, or you received a receipt for a refund. The machine has run out of change, which sometimes happens on a busy weekend or holidays. You will need to call the Rainbow Harbor office and request a “Refund Request Form”. They will mail you out the form, and you will need to fill it out and mail it back along with your receipt to obtain your refund. Other common problems include a failure for the gate arm to raise, or a failure to issue a receipt. If any of these happen to you, or you’ve tried the solutions above and they have not worked, you can call the staff at Rainbow Harbor at (562) 570-8636 between the hours of 8am and 4:30pm, or (562) 570-3101 after those hours.